The Lake is a paradise of bird watchers, situated amidst Tadoba Andhari Tiger Reserve. It is home to around 200 species of birds like the Indian pitta, white-eyed buzzard, paradise flycatcher, Indian roller, and orange-headed ground thrush flock near the lake. 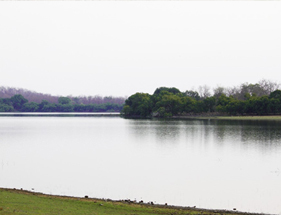 Located towards the southwest part of the reserve, this lake acts as a buffer between the forest of the park and the farmland which extends up to Irai water reservoir. It's a perennial source of water offering good habitat for the Muggar crocodiles to flourish. Around 195 species of birds with three endangered species are found here. The Crested Serpent Eagle, The Grey-headed Fish Eagle, and the Changeable Hawk-Eagle are few names of raptors existing here. Located at the distance of 6.9 Km from the Tadoba region, this village is the entry gate to the Mohrali Zone. It is one of the oldest entrances to the park for excursions and private gypsies are always available there for Jungle Safari. Mohrali Gate is 180 Km away from Nagpur.